The MPRA (Multi Pipeline Register Architecture) was modified and converted into n-task MPRA (nMPRA) by replicating the pipeline registers. While the original MPRA provided hardware scheduling, the interrupts and the events caused too long delays. The author proposes the original solutions for the interrupts and the events treatment, which represent the author's contribution to improving nMPRA; after the theoretical presentations of these solutions in the author's previous articles, this paper presents the implementations of the schemes, the results of the tests and the improved schemes. The MPRA, MPRA4 and MPRA8 implementations on FPGA (Field Programmable Gate Array) were used to evaluate performances. A detailed analysis, partially presented in this paper, shows other advantages: no extra software is required, the hardware implementation is simple, the interrupts and events are similarly handled and the tasks synchronizations and communications are completely based on hardware; MPRA has a low power consumption, even multiplied by eight times, it is reasonably necessary memory and logic resource consumption multiplied by about four times at MPRA4 (compared to MPRA) and by about eight times at MPRA8. 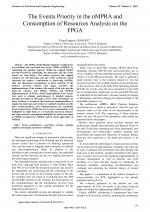 V. G. Gaitan, N. C. Gaitan, I. Ungurean, "CPU architecture based on a hardware scheduler and independent pipeline registers", IEEE Transactions on Very Large Scale Integration (VLSI) Systems, Volume: 23, Issue: 9, September 2015, ISSN: 1063-8210, pp. : 1661-1674. K. M. Mallachiev, N. V. Pakulin, A.V. Khoroshilov, "Design and architecture of real-time operating system", Trudy ISP RAN/Proc. ISP RAS, vol. 28, issue 2, 2016, pp. 181- 192. A. Purnachandra Rao, "RTOS based automatic scheduling for military application", Imperial Journal of Interdisciplinary Research (IJIR) Vol.2, Issue-2, 2016, ISSN: 2454-1362. T. N. Bao Anh, S. L. Tan, "Survey and performance evaluation of RTOS for small microcontrollers", Micro, IEEE Computer Society, ISSN: 0272-1732, 21 August 2009. N. C. Gaitan, V. G. Gaitan, E.E. (Ciobanu) Moisuc, "Improving interrupt handling in the nMPRA", 12th International Conference on Development and Application Systems, Suceava, Romania, May 15-17, 2014, ISBN: 978-1-4799-5094-2/14 IEEE, pp. : 11-15. E. E. (Ciobanu) Moisuc, Al. B. Larionescu, V. G. Gaitan, "Hardware event treating in nMPRA", 12th International Conference on Development and Application Systems, Suceava, Romania, May 15-17, 2014, ISBN: 978-1-4799-5094-2/14 IEEE, pp. : 66-69. E. E. (Ciobanu) Moisuc, Al. B. Larionescu, I. Ungurean, "Hardware event handling in the hardware real-time", 18th International Conference on System Theory, Control and Computing to be held in Sinaia, Romania, October 17-19, 2014, ISBN: 978-1-4799-4600-6 ©2014 IEEE, pp. : 54-58. L. Andries, V. G. Gaitan, "Dual priority scheduling algorithm used in the nMPRA microcontrollers", 18th International Conference on System Theory, Control and Computing to be held in Sinaia, Romania, October 17-19, 2014, ISBN: 978-1-4799-4600-6 IEEE. K. M. Mallachiev, N. V. Pakulin, A.V. Khoroshilov, "Design and architecture of real-time operating system", Trudy ISP RAN /Proc. ISP RAS, 2016, vol. 28, no 2, pp. 181-192. Shweta Ohri, "Hardware architecture of a RTOS", International Journal of Engineering Research and General Science Volume 4, Issue 2, March-April, 2016, ISSN 2091-2730. M. Ramesha, "Design and Implementation of fully pipelined 64-point FFT Processor in a FPGA", International Journal of Applied Engineering Research, ISSN: 0973-4562 Volume 11, Number 6, 2016, pp. : 3940-3943 © Research India Publications. Kirat Pal Singh , Shiwani Dod, "Performance improvement in MIPS pipeline processor based on FPGA", International Journal of Engineering Technology, Management and Applied Sciences, January 2016, Volume 4, Issue 1, ISSN: 2349-4476. E. Dodiu, V. G. Gaitan, A. Graur, "Custom designed CPU architecture based on a hardware scheduler and independent pipeline registers  architecture description", IEEE 35th Jubilee International Convention on Information and Communication Technology, Electronics and Microelectronics, Croatia, May 2012, ISBN: 978-1-4673-2577-6. E. Dodiu and V. G. Gaitan, "Custom designed CPU architecture based on a hardware scheduler and independent pipeline registers  concept and theory of operation", 2012 IEEE EIT International Conference on Electro-Information Technology, Indianapolis, USA, 6-8 May 2012, ISBN: 978-1-4673-0818-2, ISSN: 2154-0373. B. C. Alecsa, "FPGA implementation of a matrix structure for integer division", Proceedings of the 3rd International Symposium on Electrical and Electronics Engineering, Galati, Romania, 2010, ISBN: 978-1-4244-8406-5 IEEE. K. Singh, S. Parmar, "Design of high performance MIPS cryptography processor based on T-DES algorithm", International Journal of Engineering Research & Technology (IJERT), Vol. 1 Issue 3, May - 2012 ISSN: 2278-0181, pp. : 778-793. C. A. Tanase, "An approach of MPRA technique over ARM cache architecture", 13th International Conference on Development and Application Systems (AECE), Suceava, Romania, 2016, ISBN: 978-1-5090-1993-9/16 IEEE, pp. 86-90. 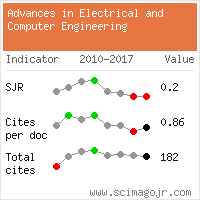 Citations for references updated on 2019-04-19 00:13 in 104 seconds.